A patch-wearing Team Pokerati player goes almost-deep in the $1k Stimulus Special, and Pauly seizes on his own feint connection to the player by becoming an dirty-rotten-scoundrel agent to potentially exploit his winnings. That’s my take on it … Pauly sees things a bit differently, however, and contends he’s the one looking out for players, because he’s the one sweating their action and making sure they get appropriately paid for their torso real estate. 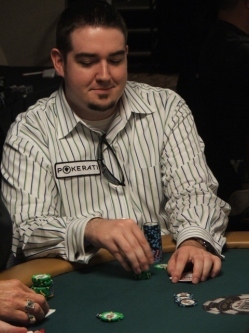 All I know is that Pauly claims to now be first-time WSOP casher Cliff Fisher’s representative, and Cliff busted out of the tourney shortly after Pauly started hounding him. Cliff is out of the Stimulus Special. He finished in 285th place (out of 6,012) for a payout of $2,921. Nice job, Clifford, and well done representin’ in your debut WSOP performance. You should feel really really good about how you played and what you did … and then after that subsides we can talk about that very questionable move you made with A-6 on the button (and then re-shoving on the flop of Q-6-x). And with that experience in mind, Cliff will be playing in his second WSOP non-circuit event tomorrow, in the $1,500 NLH. We apparently badge ’em up good … they’re playing hand-for-hand, just a few spots away from the money in the $1,000 Stimulus NLH, and yet another Pokerati preferred player is properly representin’. Cliff Fisher, aka @brdpoker, is an IT specialist from Dallas playing in his first ever WSOP bracelet event. He ended Day 1 last night by more than doubling up when he called a reasonable raise with pocket 2s, flopped a set, and got it all in to eliminate his opponent’s top-pair-top-kicker with AK. That brought him to 39,300 chips (comfortably above average). Despite his personal efforts not to succumb to superstition, he credits his success to the Pokerati patch: “As soon as I put this thing on, I started running like ultimate Goodness,” Cliff said. Though he did decide to change his shirt for Day 2, he did keep the patch on to start today, and sure enough, he’s up to 56,100 chips (avg. stack about 30,000) as they cross into the money. Follow Cliff throughout the day on twitter. CORRECTION: Cliff did not change his shirt. 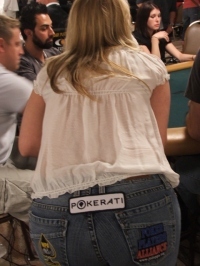 Don’t forget that the WSOP isn’t the only big poker action going on in town right now. The Venetian has its own not-so-mini series of poker four times a year, the third of which kicked off today. 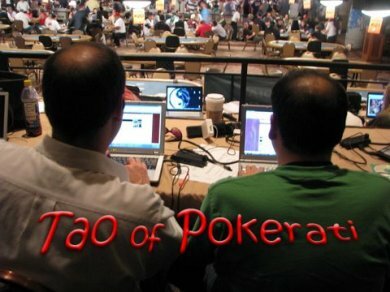 Event #1 ($300+30 NLH) of the 2009 Deep Stack Extravaganza III had a record 700 entrants — compared to 337 for the same event last year. Total prize pool: $202,650. 1st Place: $56,743. Paying 63 spots. We actually had a Team Pokerati player in the field — Cliff Fisher, aka @brdpoker — but he made it only halfway through the field (and halfway through the first level in the second-chance tourney). Cliff plays in the WSOP $1,000 Stimulus tourney on Sunday, btw. We’ll also see if we can’t find out how the other Little Big Tourneys are doing — specifically the Grand Series of Poker at the Golden Nugget, and the Caesar’s Megastacks.